The Police Dogs Worksheet – This free easy science worksheet about k-9 dogs is suitable for Grammar & Primary school kids in Grades 1-5. Pre-K and Kindergarten kids will also enjoy this fun cop dogs worksheet. Grammar & Elementary school kids can enjoy this science worksheet as a reading comprehension game while learning fun police dog facts. Preschool kids and Kindergarten kids can enjoy this k9 police dog worksheet as a listening comprehension activity game. Younger kids who cannot yet read, can use this free printable worksheet to learn fun facts about cop dogs while learning to recognize letters and words. Our Kids Easy Science Website is one of the best online worksheet resources for science. Check out our free worksheet resources and fun facts for kids sections. This free science for kids printable is a fun way to teach your kids police dog facts. What are K9 dogs? A K9 dog is a police dog, also known as a cop dog. These cop dogs breeds are German Shepherd dogs. Cop dogs were used in the first and second World War. After that, American police departments used these brave and smart dogs to help them in various military projects. Download the free worksheet for science to learn more facts about German Shepherd police dogs. [sociallocker]Download free science for kids activity sheet about police dogs. 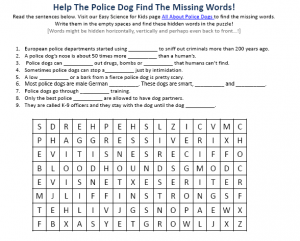 Download the FREE Police Dogs Worksheet! Enjoyed the Police Dogs Worksheet? Read lengthy police dog info here. Declan, Tobin. " Police Dogs - Best Online Worksheet Resources for Science - ." Easy Science for Kids, Apr 2019. Web. 23 Apr 2019. < https://easyscienceforkids.com/police-dogs-best-online-worksheet-resources-for-science/ >.